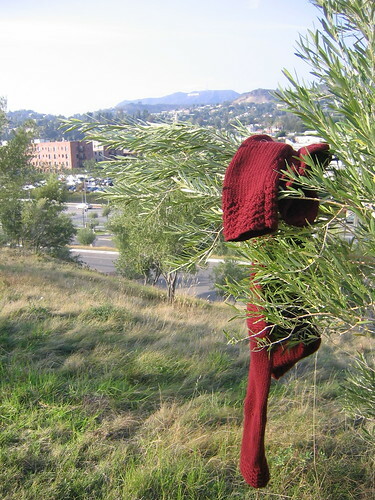 I thought I'd knit my mum red hat and purple scarf for her 60th birthday (a reference to this poem). 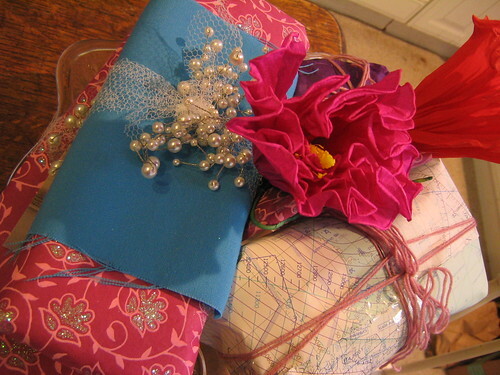 I chose my yarn and patterns, and planned to complete the projects during my trip to the USA. But knitting doesn't always go to plan. 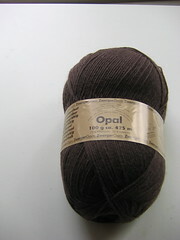 For the red hat, I planned fair-isle, mixing some red 4ply soft with opal uni in a chocolate brown. I designed a chart, cast on at Gatwick airport and, as the plane made its way to the other side of the Atlantic, got about half way through. 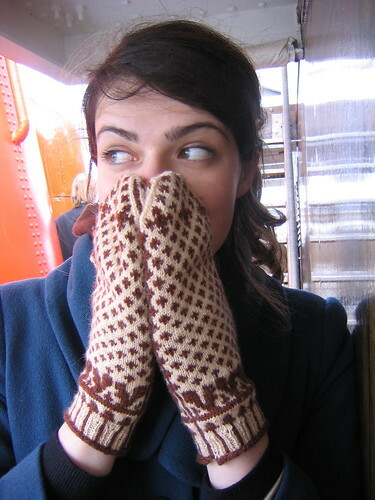 But as we landed, I decided I didn't like colour combination in fair-isle, and frogged the lot (the brown yarn and chart pattern became these mittens). Stranded in DC with limited internet and a whole ocean away from my pattern book collection (not to mention needles), I was a bit stuck for what to do. 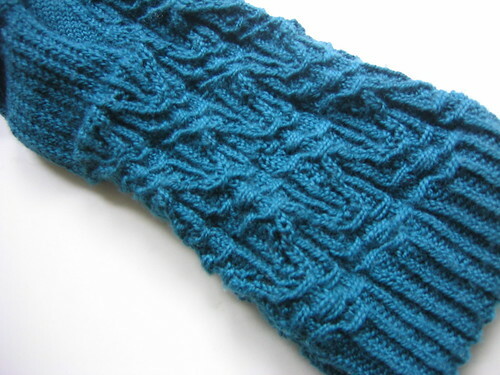 I had a 3.25mm circular with me to make the scarf, so did a gauge swatch with the yarn held double, trying out the cable pattern I could do from memory (I'd just used it in this sock). 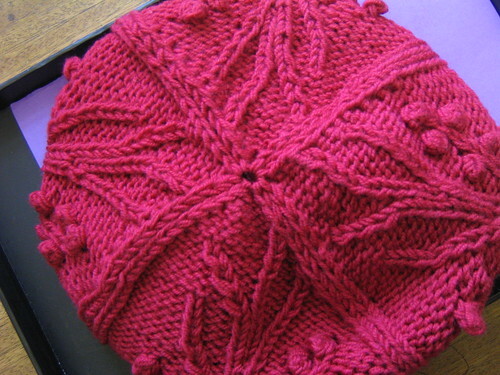 It worked pretty well, and the double-held soft yarn made for a lovely warm and squishy hat. I'm particularly proud of the the in-pattern crown decreases. 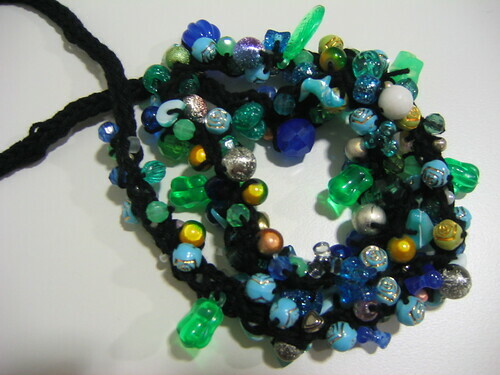 I don't know if I could write out the pattern, as the whole project was pretty free-form, but I'll maybe have a go if I have time before Christmas. 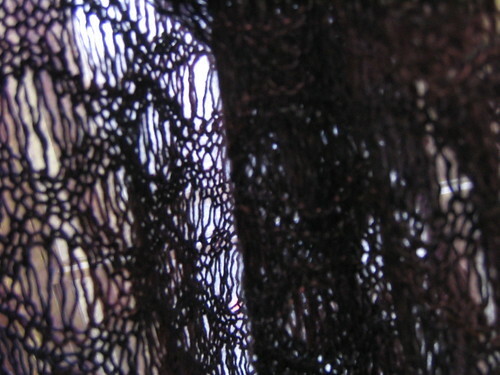 This half of the project completed, I cast-on for a lace scarf. 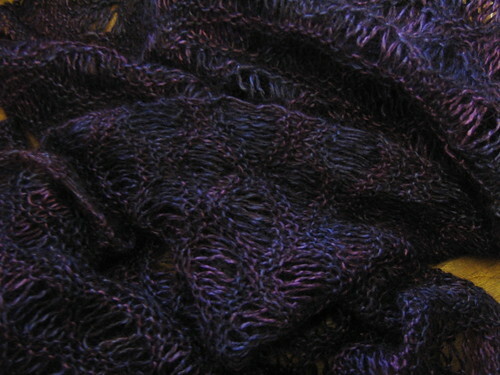 Swallowtail in a soysilk laceweight which I planned to dye purple once knitted-up. 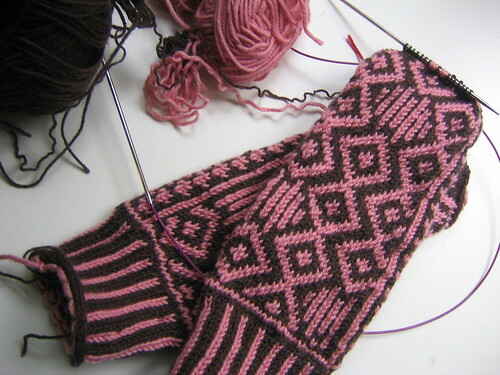 I worked out how to add pattern repeats to make it big enough, and got most of the way through. But the p5tog's in the boarder were my undoing. 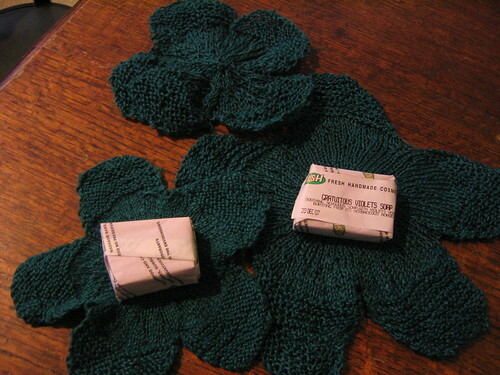 I mis-placed one (knitting lace while gossiping...) so frogged a few rows back to re-do them. 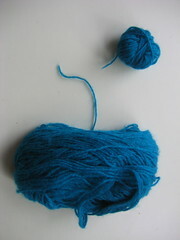 But the p5tog's acted as a knot, and I literally had to rip it apart, cutting the yarn to bits. As I did this, a load more unravelled in a way I couldn't possible pick back up (and I'm pretty good at using a crochet hook to re-knit a few rows down). More ripping. So much that I lost more yarn than I could spare - I wasn't going to have enough left to re-knit the ripped bit and finish the thing. Bye bye soy-swallowtail. 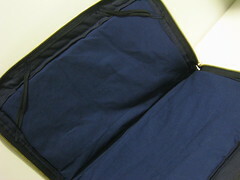 You can see a picture here. 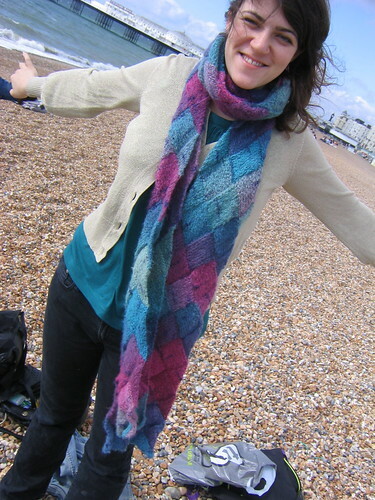 It is the only thing I've knitted that has actually ended up in the bin. By then I'd got to California, so visited Artfibers in San Francisco hoping to find something special enough to make a replacement with. What a shop! 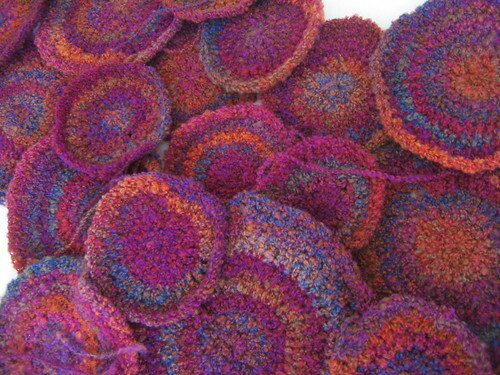 They have the most beautiful, unusual yarn. 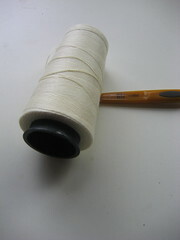 They also have mini-skeins you can knit with to see if you like it and try out stitch patterns. There are examples of swatches and pictures of finished pieces hanging up all over the place for inspiration. 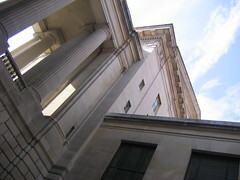 It has a really relaxed and friendly environment too, yet also extremely professional (photos here and here). 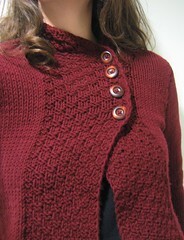 As soon as I cast on with their Alfabeto, I knew it was perfect - so warm and silky, yet also very light. It has a very dark purple base, almost an oily black, with bits of blue, pink and red shot through (I couldn't get a photo which did it justice). 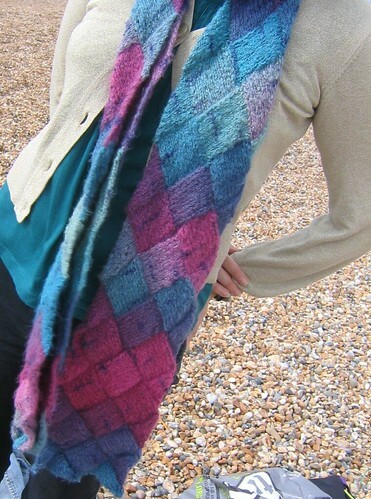 It's 76% silk, 19% mohair, 5% wool - gorgeous stuff. As a variegated yarn, I decided I'd go for a relatively simple garter-stitch based seafoam stitch, which also gives it a nice drape. It took a bus trip from San Francisco to LA, the plane from LAX to JFK and several commutes to and from work once I was home to finish, but I got it done in time for the birthday itself. 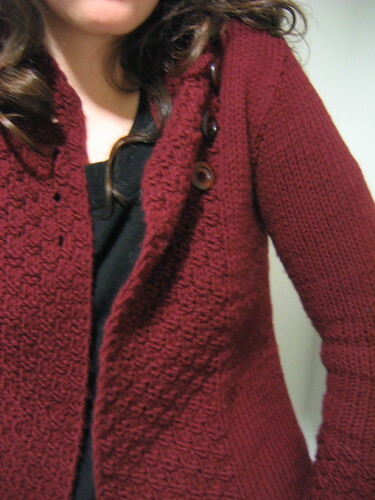 I'm really pleased with it, though I think the credit goes largely to Artfibers for such delicious yarn. So, neither piece was quite what I was planning, and all improvised on the road. But I was pretty pleased with it in the end. 7:45am on a Sunday morning is maybe a bit early for blogging, but Marcus had to leave at 7am for a football game. I couldn't get back to sleep, so thought I might as well catch up. 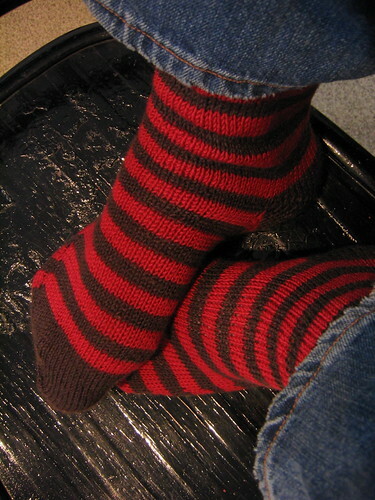 A while ago I knitted a single sock for the ADD knitter. 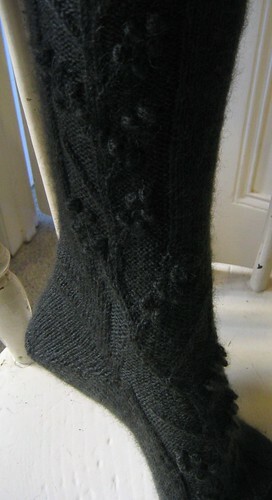 In exchange, I've received a single sock of my own - this beautiful Gothic Spire from Zeitgeistyarns. 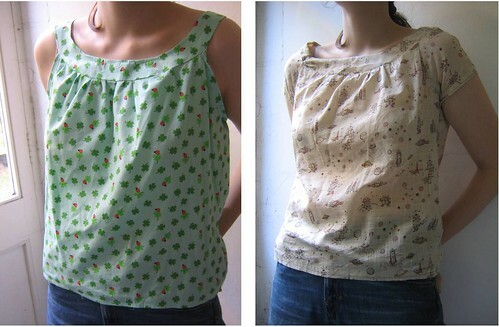 When swaps work out, they really are wonderful things. 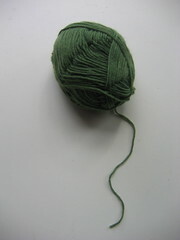 The colour, the feel of the yarn and the pattern are all amazing - I can't wait to get started. 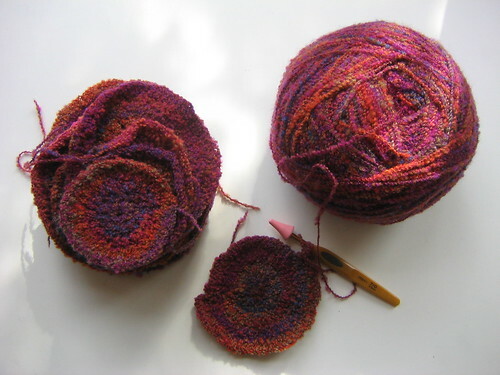 Her generous package also included the needles - knitpicks circs, which its great to have a try of as they are only just starting to be available in the UK. 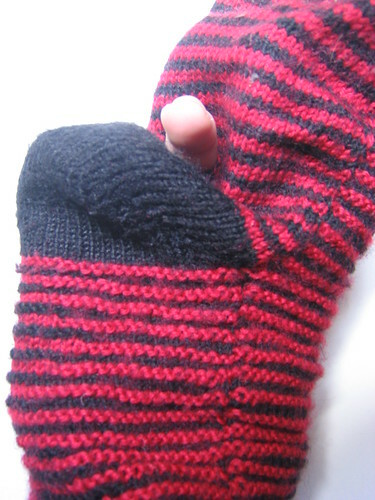 I've cheated though, and am first using one of them to finish off my current WIP, a pair of mittens. I was working this on the plane, so was using bamboo dpns for that 'these are really just sticks gov' look when going through security. 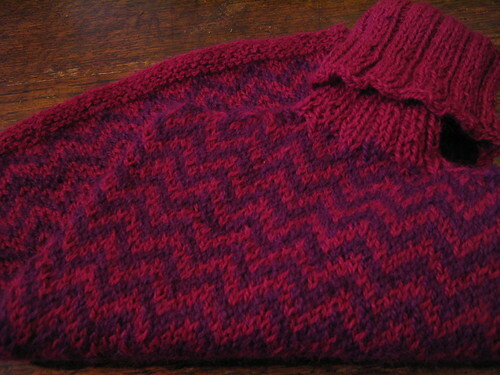 I find dpns can be neater for colourwork, but generally a lot less comfortable. Now I'm off the plane and with a spanking new 2.5mm circ it was much easier going. They are nearly finished, I only really have the thumbs to do. It's my own design - would people be interested in the pattern? EDIT: yarn for mittens is cashmerino baby (pale peach) and opal uni (brown). The cashmerino is thicker than the opal, but that actually helps it 'pop'. I arrived in LA last night. As the plane circled the city to land, the ash-smog enveloping the area was still pretty obvious. I'm noticing the air quality's pretty bad, even to my London-battered lungs. This morning we went out for proper American breakfast before Alexis went off to class. I pottered around the area she lives in (and found a bookstore to snoop at the new Debbie Stoller). I had two cardigans on, and was pretty amused that it was much colder in LA than it had been in DC. 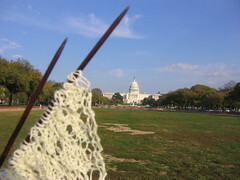 It was still pretty smoggy, but I went to the local park and sat and knitted for a bit. Then I popped on the metro downtown to MoCA. After finding the gallery (it took a while, seeing as I was on foot rather than LA-usual car) I discovered it was shut on Wednesdays. Darn it. I walked about a bit, visited the public library, and mused that it was a lot warmer now; all sunny and "proper LA". At that point I realised I was only wearing the one cardigan. Double darn it. I'd left the thicker one in the park in Los Feliz. 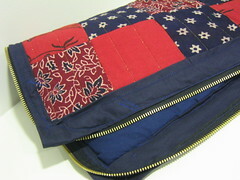 It was the drops jacket I'd whipped up before leaving for the US. Seeing as it was so warm in DC, I'd hardly worn it. I hadn't taken any picture of it yet - I thought I'd get Alexis to take pictures of me wearing it in some American setting. I went back to the park, hoping that maybe, just maybe it'd still be hanging where I'd left it. Of course, it wasn't. Darn, darn, darn. Walking dejectedly back down the steps to town, I spotted it! Splayed in a tree, where I gues someone threw/ hung it. You might just be able to make out the Hollywood sign in the background. By this point the smog had cleared a bit and there was a lovely, fresh breeze. I picked the branches out of the jacket and played around taking photos of the view and walked around Los Feliz a bit more. I bought some amazing tacos and generally enjoyed noting how very different the place is from DC. I'm in DC. At least for the next coupe of hours, as my flight to LA leaves this evening. 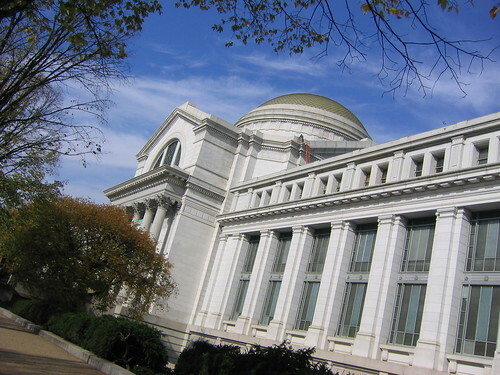 The photo above is of the Smithsonian Natural History Museum building (still say ours is prettier). 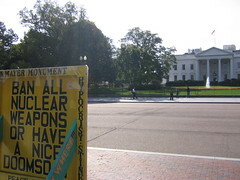 I've really loved DC - for some reason I thought it would be dangerous, unfriendly, ugly and impossible to walk around. I was wrong. Now the conference is over, today I did museums, and geeked over kids science literature in bookstores. But mainly I just wandered about what I've discovered is a really beautiful city. 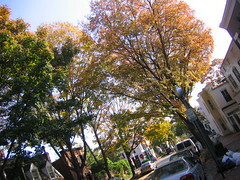 The weather has been great and sun shows off all the autumnal colours. Plus, I followed Lolly's recommendation of Teaism and had the best noodle soup I think I've ever tasted. What am I knitting in the bottom left picture? That'd be a secret. 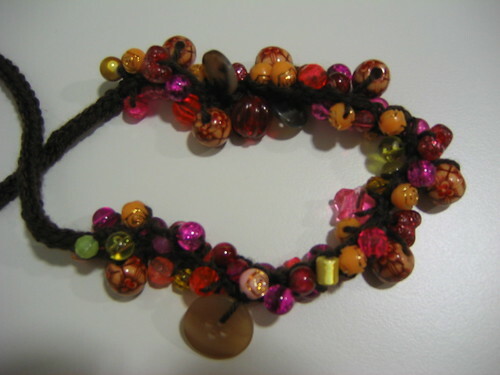 As I'm uploading photos though, I'll leave you with a few pictures of some beaded icord I've done recently. On saturday we took the Paddlesteamer from Tower Bridge to Whitstable (my pic here). It went right down the Themes, then out to the sea, via Southend. You could walk around the middle of the boat to see the steam engine at work and take a peak out of portholes to see the paddles go round and round. Plus, I wasn't the only person knitting on deck. All very exciting. Slightly cold too, which allowed some re-discovery of FO's gone by. 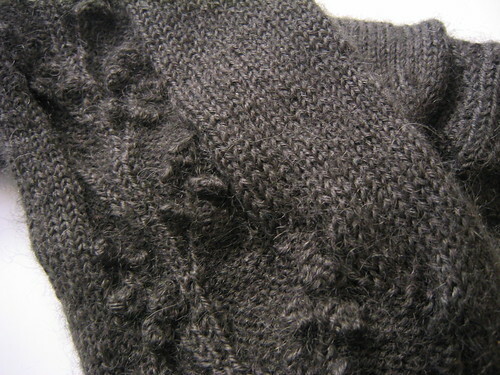 One the left side, a slightly better shot of my squirrelly mittens. 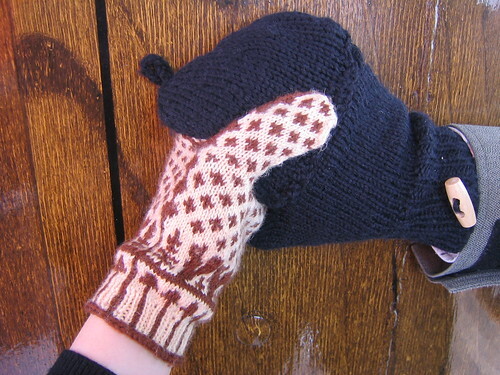 On the right, Marcus is wearing a pair of mitten-topped gloves I made ages ago, pre-blog (loosely based on the broadstreet pattern). They've lasted really well, he wears them all the time. Marcus also caught me engaging in some sneaky yarn sniffing. 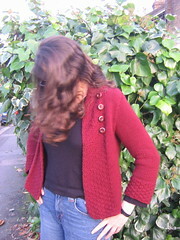 A 'ps' for ravelry users: I'm a stupid person and had "messaging" switched off for a load of last week. So if you messaged me, friended me or left a comment and didn't get a reply, give me a poke. 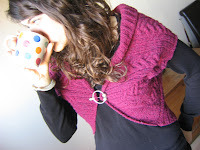 I'm on ravelry, my username is slippedstitch if you want to be friends. 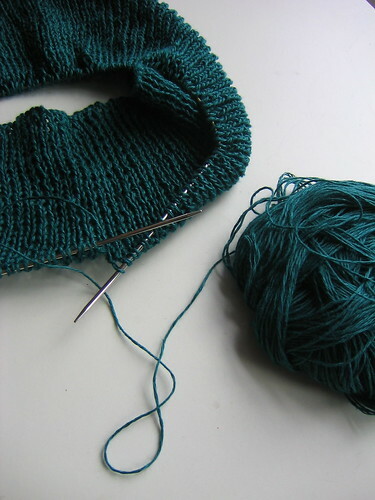 For those who aren't on it yet, it chiefly a way of combining a super-organised knitting notebook (what you've done, what's in your stash, what you might do next, stuff you've seen you like) with the folksonomies of web2.0. It does this very well. 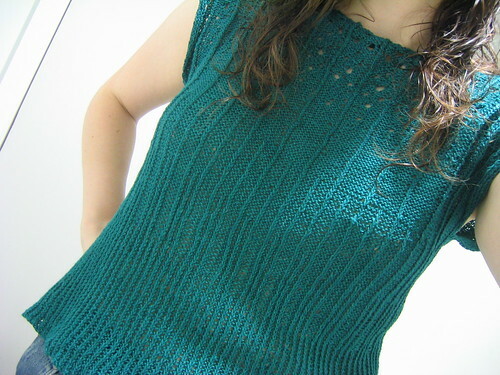 So, with the prompt to organise myself provided by ravelry, I got around to photographing my current WIP (above) - a top called 'bottoms up'. 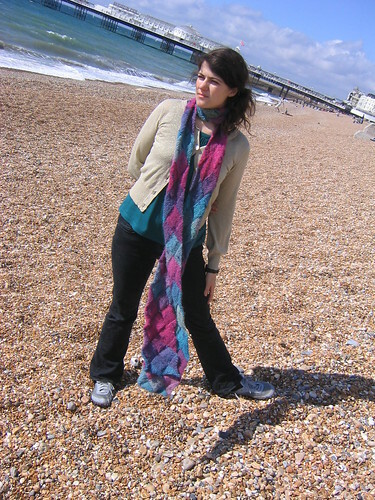 In contrast to the webiness of ravelry, this is from a 'dead tree' publication: the first edition of Yarn Forward. 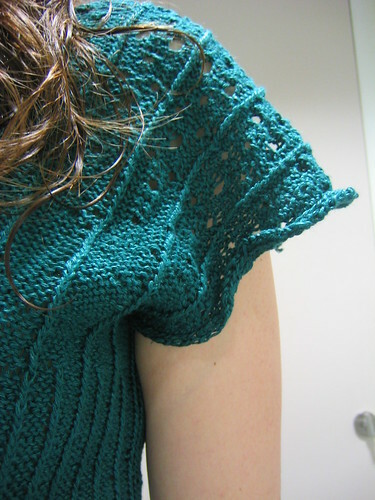 It's a lightweight, relatively glam top (think Orangina); check out pigwotknits' wip of a long-sleeved one. It's my own design, but I did a smaller size for the magazine and wanted one to fit me. 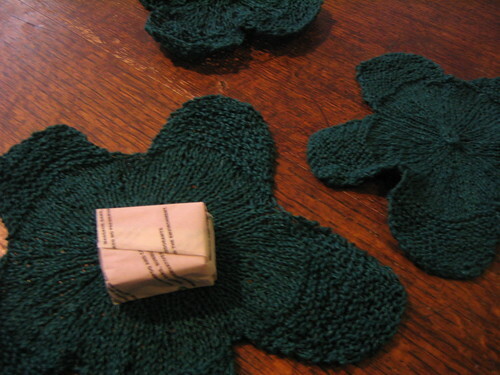 I bought the yarn ages ago (Euroflax linen) and hoped to have it done by summer, but other projects kept coming up. 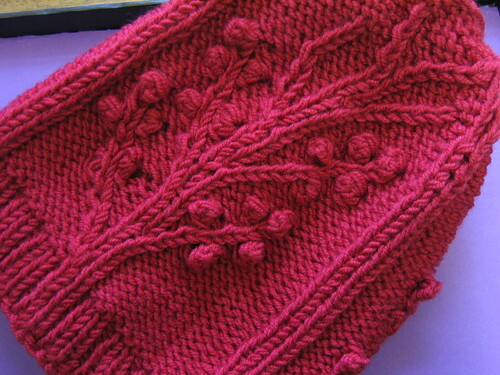 The pattern starts off in the 1x1 twisted rib shown, then gradually flattens out to more and more stocking stitch, growing further with eyelets around the shoulders (all shaping's done by change in stitch pattern). Originally designed in a light pink cotton, the eyelets emerging from horizontal lines of twisted rib were inspired by bubbles in a champagne cocktail. 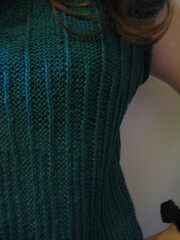 But in this green, I think it'll be more like light coming through tree-tops. We shall see. I was going to do it in a champagne colour, but fell in love with this emerald. 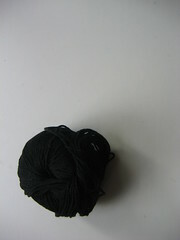 I also photographed all my currently stashed yarn. 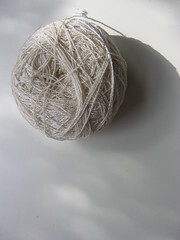 All these photos are all links to flickr, where I've made notes on each yarn. 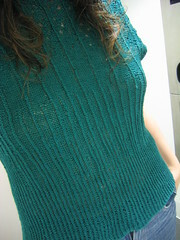 A bit of a 'vintage' FO as I finished it ages ago. It just took a while for the pattern to go up and me to get round to linking to it - here it is (WARNING: links to pdf). A (cheshire) cat. He hides, you seek. Go on. You know you want to knit some. Because everybody needs a pair of kitty-illusion socks where the feline appears and disappears as you point your toes and the tail twists itself leisurely up your leg. 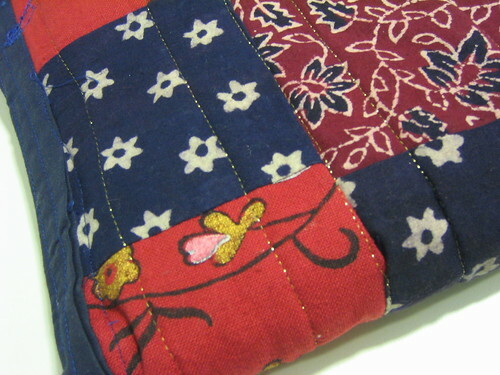 For Purlescence's luxurious style, I used cashsoft, so have given them leather patches on the soles (for slipper socks), but the pattern would work just as well in a more hard-wearing sockyarn. Thanks to Robynn for her great competition which inspired the project and Kirsty for acting as legs model for the pics.